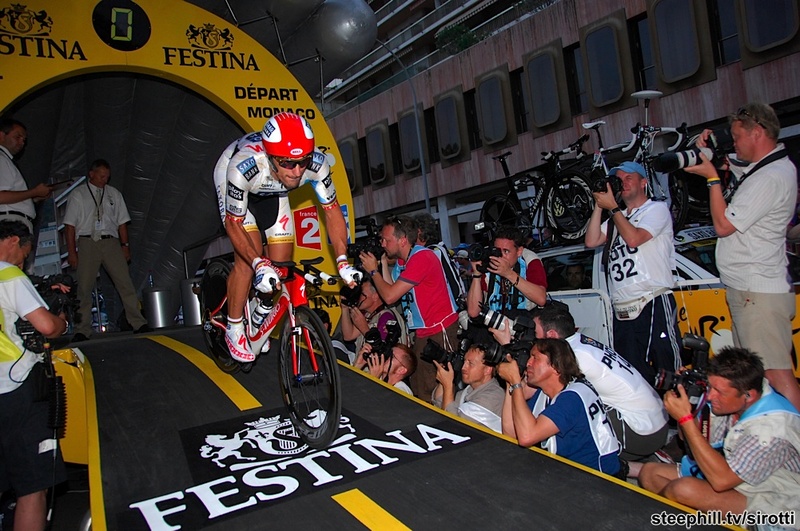 An on-form Fabian Cancellara won today’s opening time trial stage of the Tour de France. The former World Champion trailed Bradley Wiggins at the top of the Côte de Beausoleil, and it looked for a time as if the British rider from Garmin-Slipstream would wear the first Yellow Jersey of the Tour. Spanish time trial champion Alberto Contador of Team Astana then blasted over the côte with a still faster time. But Cancellara was having none of it. The Swiss talent, who has twice before won the opening time trial at the Tour, used his acrobatic bike handling on the sinuous descent back to Monaco. The Olympic and former World champion in the time trial has otherworldly bike-handling and he needed them on the narrow, twisting road into Monaco. Inside the final kilometers Cancellara overtook his minute-man, Giro d’Italia winner Denis Menchov, himself no slouch against the watch. At the line, Cancellara beat the time of Bradley Wiggins by 19 seconds, a significant margin in a 15.5 kilometer test. Still out on course, Alberto Contador continued his big ride, but could not match the speed of Cancellara. Contador, whose time trial skills have improved significantly this season, finished second, 18 seconds behind the Swiss champion. In the battle for the general classification, Contador has seized an early advantage, though Australian Cadel Evans of Silence-Lotto sits just 5 seconds behind. “I have showed that I am the best specialist in the time trial,” declared Cancellara after the stage. No need for false modesty from the Swiss talent. Cancellara explained that he took his share of risks to win the stage, but dismissed them as “normal.” “I know how to pilot my bike very well,” he commented. Recognizing his advantage in the descent and the flats, the Saxo Bank rider held back on the climb. In the end, he could see Denis Menchov. “That was where I made the difference,” Cancellara said. The Swiss talent has had a difficult season, which included a training crash at the beginning of March. The crash ruined his preparation for the Ronde van Vlaanderen, his main objective for the Spring. “It was a difficult moment, because I have known three or four years of big victories,” Cancellara recounted in Monaco. The Swiss rider said he hopes to keep the jersey as long as possible, and with no time bonuses for the stage winners, he could hold the jersey for much of this first week. In the general classification battle, pre-race favorite Alberto Contador has given notice that he has come to this Tour de France with excellent form. The Spanish rider from Team Astana had the fastest time of the general classification favorites in Monaco. He has also put himself at the top of the team hierarchy at Team Astana, at least for now. Contador leads Andreas Klöden by 3 seconds, Levi Leipheimer by 12 seconds, and Lance Armstrong by 22 seconds. According to Astana’s press comments, Contador is the undisputed team leader for this race, but many observers have wondered how well the talented cast at Astana will work together. After all, Leipheimer finished only 31 seconds behind Contador in the 2007 Tour. Klöden has also stood on the podium in Paris, while the returning Armstrong has won the Tour de France a record seven times. Today’s performance should put some of those doubts to rest, though it remains to be seen just how well the team supports the Spanish rider in his efforts to win a second Tour de France. Looking beyond the Astana Ménage, Cadel Evans sits just 5 seconds behind Contador. The Australian has finished second at the Tour for two years running. In 2007, he fell just 23 seconds short of beating Contador. This year, Evans out-rode the Spanish talent at the opening time trial of the Critérium Dauphiné Libéré, but could not repeat that performance today. Still, the Australian has ridden into a good position with three weeks of racing to go. Last year’s winner, Carlos Sastre of Cervélo TestTeam sits 47 seconds down on Alberto Contador. Sastre is never at his best in the first week of a grand tour. Solid, though not spectacular against the watch, Sastre will wait for the mountains. His best chances will come on the three mountain top finishes of this year’s Tour, and the difficult mountain stages of the third week. No doubt he would like to be closer to Contador on time, but the quiet Spanish climber is not one to worry and will wait patiently for his chance. Though he has yet to finish high in the Tour’s general classification, Roman Kreuziger of Liquigas-Doimo has opened his Tour campaign with a strong ride against the watch. Kreuziger, who last year won the Tour de Suisse, sits 14 seconds behind Contador. The Czech all-arounder shares team leadership duties with Italian Vincenzo Nibali, who also did a good ride today. Nibali sits 19 seconds behind Contador. Nibali has frequently faltered in the high mountains, but this year’s Tour course, with only three mountain top finishes, may suit him better than most. On the subject of young talents, Andy Schleck of Saxo Bank now sits 41 seconds behind Alberto Contador in the general classification. Widely touted as a future winner of the Tour de France, the younger Schleck brother will need a big ride in the mountains to overtake Alberto Contador. Indeed, the battle between Schleck and Contador in the mountains could well turn out to be one of the highlights of this year’s Tour. Certainly, Schleck will have strong support from his Saxo Bank team. Last year’s fifth place finisher Christian Vandevelde of Garmin-Slipstream crashed out of the Giro, and has steadily rebuilt his form over the past month. Vandevelde finished seventeenth today, and sits 39 seconds behind Alberto Contador. Vandevelde is typically better against the watch than in the mountains, but he is a consistent rider who could ride into the race. Don’t count him out just yet, though it will be a big ask for the American to repeat his high finish of last year. Vandevelde’s team-mate Bradley Wiggins finished third in Monaco and some in the press have touted his chances as a general classification rider. During the first week of the Giro, Wiggins rode high in the standings, but has said that he does not handle successive days in the high mountains especially well, which is a necessary skill for chasing the Yellow Jersey. It was a rough day over at Rabobank, meanwhile, where team leader and Giro d’Italia winner Denis Menchov did not have a good race in Monaco. The Russian, who typically rides well against the watch, finished 1:31 down on Cancellara, who caught him in the closing kilometers. Menchov now trails Contador in the general classification by 1:13. 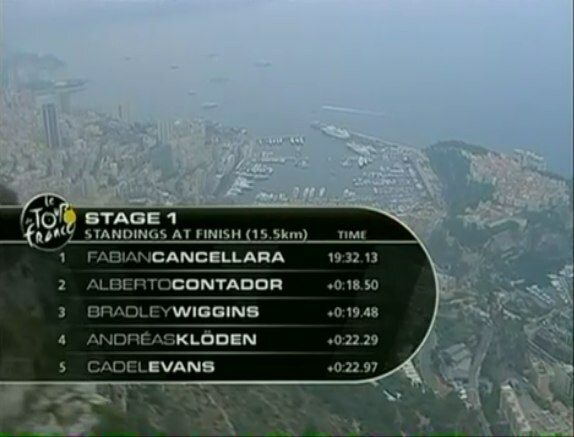 His Rabobank team-mate Robert Gesink finished 1:15 down on Cancellara, and sits 57 seconds down on Contador. Gesink makes his Tour de France début this year, and is at his best in the high mountains. Though his time trialing has improved steadily, he has not yet gained the strength to challenge the top riders. Perhaps Gesink will find the Polka Dot Jersey to his liking, but with three weeks left to race, it is too early to rule out a good general classification finish for the young Dutch rider. Alberto Contador had the fastest time at the first intermediate time check on the Côte de Beausoleil, and now leads the mountains classification. The Green Jersey of points leader goes to stage winner Fabian Cancellara, but Bradley Wiggins will wear the jersey for tomorrow’s stage. In the white jersey competition, Roman Kreuziger of Liquigas-Doimo leads Tony Martin of Columbia-HTC by 1 second. Vincenzo Nibali of Liquigas-Doimo is third at 5 seconds. With four riders in the top ten of today’s stage, Team Astana leads the teams classification. Saxo Bank sits second at 31 seconds. Tomorrow’s stage runs between Monaco and Brignoles. The course follows the Mediterranean coast for much of the day, before turning inland to finish in Brignoles. There are four categorized climbs on the profile, though none of them is especially difficult. It should be a day for the sprinters’ teams to shine, but the climbs will complicate their efforts to keep the breakaways in check. It’s rare for a team not to defend the race leader’s jersey, and we can expect to see Saxo Bank on the front tomorrow. But they will be looking for help from the sprinters’ teams, and if they don’t find it, Cancellara’s team may let the jersey go. For Saxo Bank has ambitions to win this Tour de France with Andy Schleck, and they will not want to run short of legs in the crucial mountain stages of the third week. Still, Cancellara has said he wants to hold the jersey for as long as possible. 2009 år’s upplaga av touren börjar i furstendömet Monaco med en tempoetapp. Banan börjar vid foten av bergen precis utanför staden för att sedan påbörja nedstigningen till den flata avslutningen mellan lyxiga hotell och de sandiga stränderna vid medelhavskusten. Med sina 15,5km så är etappen för lång för att vara en prolog, och kommer ge en tidig indikation på vem som har form för att vinna Tour de France. Banan inkluderar en kategori 4 stigning, Côte de Beausoleil, bokstavligen, ”vacker sol”, som når en maximal höjd av 205 meter. Den andra halvan av banan planar ut till en flack avslutning längs med stranden på Boulevard Louis II nära Port Hecule. Roliga fakta! En genomsnittlig person kan gå igenom Monaco på mindre än en timma. Landet är på tre sidor omgivet av Frankrike, och ligger inte långt ifrån San Remo vid Italiens kust. Under åren har Monaco varit under både Franskt och Italienskt styre. Monaco är för övrigt världens andra minsta land efter Vatikanstaten för de som håller räkningen där hemma. Åter till cykeltävlingen. Tempoloppet startar och avslutas i närheten av Port Hercule. Banan börjar nästan omedelbart med en stigning när cyklisterna tar sig an backarna precis utanför staden. Sedan in på Franskt territorium där man ska upp 200 höjdmeter de första 7,5 killometrarna. Stigningen har en snittlutning på 2,7 % och är klassificerad som en kategori 4 stigning. Det går uppför i kortare partier, sedan platåer. Stigningens topp nås 8 km ifrån slutet. Efter det så är det utför hela vägen. Från toppen av Côte de Beausoleil, så letar sig banan ner mot Moyenne Corniche till Avenue du President Kennedy. Banan sluttar 150 höjdmeter på 4km, så det är ingen brant utförskörning. Genomsnittet ligger på 3,8 %. Från Avenue du President Kennedy så är det en liten sväng ner på Avenue Notre-Dame de Bon Voyage, sedan en hårnålskurva till Avenue Jean Jaurès. Längs med kusten så blir banan mer flack och återvänder från franskt territorium tillbaks till Monaco. Väl inne i Monaco återstår det 4 km. Det är en rad 180 graders svängar innan cyklisterna kommer in på den avslutande 3 kilometers raksträckan in mot mål på Boulevard Louis II i Port Hercule. I Monaco är det är inte ovanligt med vindar som blåser från havet på eftermiddagen. Detta kan leda till att cyklister som startar senare kan stöta på vindar de sista kilometrarna på Avenue de Princesse Grâce. Stigningen kommer mer sannolikt avgöra utgången för loppet än vindförhållandena då Monaco är känt för sitt milda väder under sommarmånaderna. Banan på denna första etapp har mycket gemensamt med de korta tempoetapperna som öppnade både Paris-Nice och Critérium Dauphiné Libéré. I båda dessa etapper så hade tempospecialisterna svårt att nå fram till seger och podium blommorna gick till cyklisterna som slogs om slutsegern. Alberto Contador vann den öppnande tempoetappen i Paris-Nice, medans Cadel Evans vann första etappen av Critérium Dauphiné Libéré. Denna Tour etapp är väldigt lik först etappen i Dauphiné Libéré, som även den började med e stigning. Men, den första gula ledartröjan från Tour de France är ett enormt fint pris och tempospecialisterna kommer vara toppade och redo för stordåd. Fabian Cancellara vann det olympiska tempoloppet i Beijing och är dubbel världsmästare i samma disciplin. Under 2004 så vann han Tour de France prologen i Liège med 2 sekunder över Lance Armstron. En riktig prolog, 2004 års etapp sträckte sig inte mer än 6,1km. Cancellara kommer dra fördel av denna längre distans och kan mycket väl vara den första att bära den gula ledartröjan under 2009 års Tour de France. Om jag var en spelare, vilket jag inte är, så skulle jag tippa Cancellara som vinnare av Monaco etappen. Självklart så är Cancellara inte den enda cyklisten med ambition att vinna den prestigefulla öppningsetappen. 2005 så vann David Zabriskie den 19km långa förstaetappen av Tour de France. Precis som Cancellara året innan så slog Zabriskie Lance Armstrong med 2 sekunder. Zabriskie är regerande Amerikansk mästare i tempo. Han visade god form i några etapplopp tidigt på säsongen, och körde även Giro d’ Italia som förberedelse inför årets Tour de France. De senaste månaderna har det varit tyst på resultatfronten och utan tvekan så har han haft Monaco etappen inringat i sin kalender. Zabriskie kommer kämpa på denna etapp, men han kommer få problem att slå Cancellara. Zabriskie har placerat sig bakom Cancellara i deras senaste möten i VM . Men den kortare distansen kan visa sig vara en faktor och det borde bli en jämn kamp mellan de 2 specialisterna och forna lagkamraterna. Andra som jagar etappsegrar inkluderar: Gustav Larsson från Saxo Bank, som kom 2.a på det olympiska tempoloppet förra året. José Ivan Gutierrez från Caisse d’Épargne, en före detta spansk nationsmästare i tempo och 2.a i VM 2005. 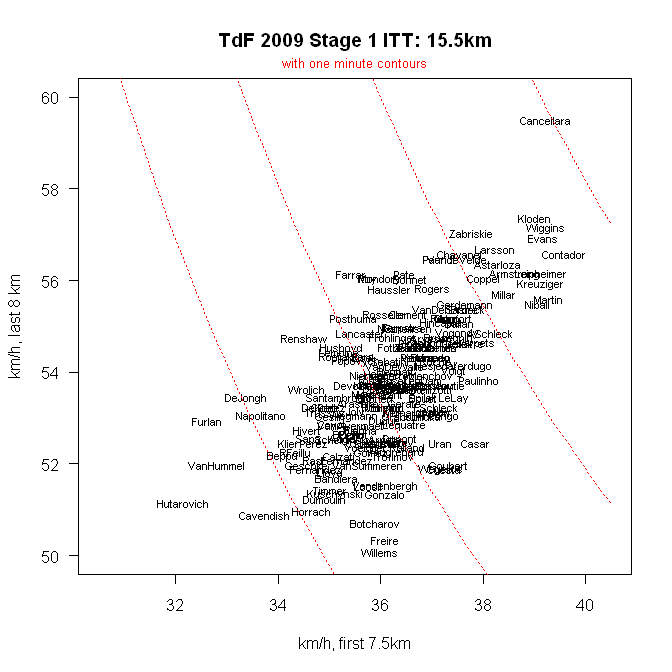 Bradley Wiggins från Garmin-Slipstreamm, en tvåfaldig olympisk guldmedaljör och kom på en fjärdeplats på 2007 års Tour de France prolog. Stef Clement från Rabobank, 3.a i världsmästerskapen i tempo 2007, Thomas Lövkvist från Columbia-High Road, före detta Svensk mästare i temp, och Benoît Vaugrenard från Français des Jeux, en före detta fransk tempomästare och kom på en 8.e platts på öppningsetappen i Dauphiné Libéré. Bland de cyklister som kör för det totala sammandraget, Cadel Evans och Alberto Contador borde kör bra här, speciellt efter deras starka insatser på den inledande tempoetappen på Critérium Dauphiné Libéré. Evans brukar generellt köra bra mot klockan, men Contador cyklade riktigt bra i Paris-Nice. Se när dessa två fortsätter deras nära rivalitet från Dauphiné Libéré, och när de förmodligen går i mål med liten tidsmarginal emellan dom. Contador’s stallkamrater Levi Leipheimer, Lance Armstrong, och Andreas Klöden, borde också köra bra i denna öppningsetapp, som bäddar för flera hot till det totala sammandraget från Astana teamet. Det, eller en bitter intern team rivalitet. I nyliga kommentarer i pressen så har Contador nämnt både Leipheimer och Armstrong som rivaler i kampen om att böra den gula ledartröjan i Paris. Båda amerikanerna har placerat sig bra i tidigare tempolopp, men båda har också lidit när det gått uppför i årets Giro d’ Italia. Kommer de med bättre form till Frankrike? Contador måste hoppas att så inte är fallet, då han säkert inte vill köra mot sina egna lagkamrater i kampen om det totala sammandraget. Astana ser i alla fall ut som det stall som troligtvis kommer dominera lagtävlingen efter denna första tempoetapp. Den öppnande tempoetappen borde också ge Denis Menchov en chans att få ett tidigt övertag. 2009 års Giro d’ Italia segrare trivs med tempo och borde gilla den här banan. Likväl för Roman Kreuziger, den unga Tjeckiska cyklisten från Liquigas-Doimo som förra året vann Tour de Suisse och i år kom 2.a bakom Cancellara i den inledande tempoetappen i samma tävling. När han förra året körde sin första Tour de France så kom Kreuziger på en 13.e plats i sammandraget och nu hoppas han utan tvekan på att förbättra sitt resultat. Han kommer dela kaptens-skapet med Vincenzo Nibali, som nyligen slutade topp 10 i Critérium Dauphiné Libéré. Franco Pellizotti, som placerade sig på en 3.e plats under årets Giro d’ Italia, kommer också köra touren för Liquigas-Doimo, men det är osannolikt att han ska placera sig högt upp på öppningsetappen. Vänta tills bergen för att se den blonde Pellizotti i täten. Fyra i det totala sammandraget förra året på Touren, Christian Vandevelde har alltid cyklat bra mot klockan, men Amerikanen råkade ut för en krasch på Giro d’ Italia, vilket har höjt tvivel om hans chanser att upprepa sin fina placering i sammandraget. Han visade verkligen inte så god form på det nyligen avslutade Tour de Suisse, men han kanske kan klara av att göra ett bra resultat över den korta distansen som denna tempoetapp utgör. Men hans chanser att stå som segrare i Paris ser inte gynnsamma ut. Klättrarna kommer bli glada av att se vägen gå uppför det första 7 killometrarna, men lutningen är inte brant nog för att ge dom så mycket fördel. Carlos Sastre från Cervélo TestTeam kommer troligen starta sitt Tour äventyr med en tidslucka fram till hans konkurrenter, men med bara 15km att köra, så borda han inte tappa allt för mycket. Förra årets Tour vinnare är aldrig som bäst under första veckan, men klättringen i början av etappen kommer att hjälpa han. Över till Saxo Bank, Andy Schleck är också mindre brilliant mot klockan än hans rivaler, men liksom Sastre så kommer han dra nytta av den första stigningen. Dito för Fränk Schleck som inte har någon passion för tempobågen. Den äldre Schleck placerade sig som 6.a i sammandraget på förra årets Tour, och startar detta race med delat kaptens-skap med sin bror Andy, som redan har vunnit Liège-Bastogne-Liège denna säsong. Andy Schleck kommer troligtvis visa sig vara den bättre av bröderna i de stora cykelloppen och han har placerat sig som nummer 2 i Giro d’ Italia. Fränk Schleck har också lidit av knäprobelm senaste tiden, och kanske inte är som bäst när Touren startar i Monaco. Allt som allt, så förväntar jag mig en nära kamp mellan cyklisterna som kör för det totala sammandraget på öppningsetappen. Distansen är relativt kort, och den inledande stigningen ger klättrarna en chans att begränsa sina tidsförluster. Touren kommer inte vinnas under den första etappen, men denna tempoetapp erbjuder möjligheten för en cyklist i form att få en fördel över sina rivaler. Det kommer också sätta en inledande hierarki mellan teamen och cyklisterna före den första rundan av bergsetapper i Pyrenéerna.